The company formerly known as WeWork has rebranded as the We Company — although a better name for its network of on-demand office spaces for the newly incorporated and nominally employed; co-living spaces for the same Easyjet-set; and educational and coding services could be “House of Cards”. The knock against the company has always been that it was a real estate investment masquerading as a tech company (a case which the FT made magisterially last year). In the blog post, WeWork chief executive Adam Neumann laid out the company’s new strategy which divides the company into three different business lines, WeWork (real estate), WeLive (its co-living spaces) and WeGrow (for education). For the We Company to succeed a few things need to happen. Revenue needs to rebalance to the WeLive and WeGrow businesses quickly and it needs to grow its services even more aggressively. And the result of each needs to be actual profitability. There aren’t a lot of really hard metrics to gauge the company’s current performance on. But the good people at Bloomberg did uncover actual financial data on the company’s debt, which is underperforming compared to industry benchmarks. Neumann said that the original vision of the company was an all encompassing network of offerings that would help customers, bank, shop, live, and play. 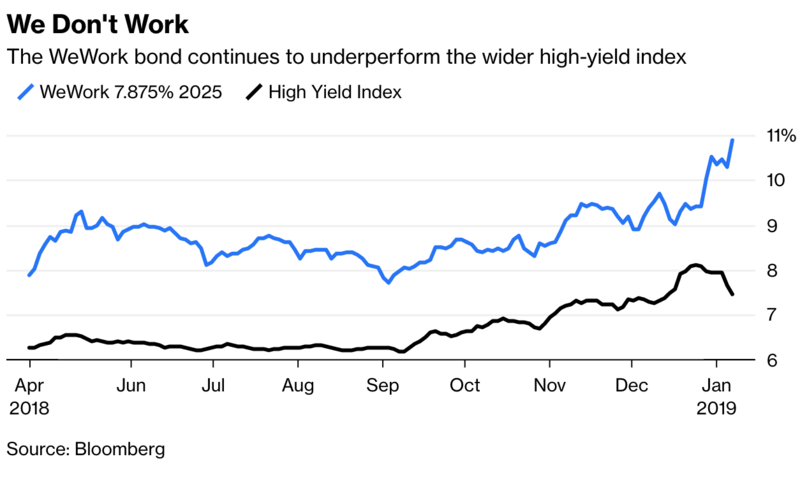 That’s a mighty goal worthy of a Vision Fund, but its vision may turn out to be a fever dream if the indicators are right and the worldwide slide into recession finally happens.